This lecture is devoted towards the discussion of the Pharyngeal Apparatus. In the beginning of section one, the educator talks broadly about the Pharyngeal Apparatus followed by a description of Pharyngeal Arches. 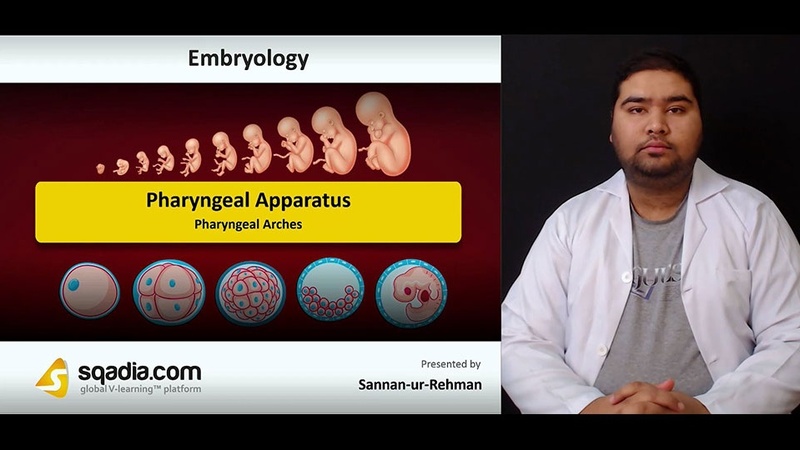 Afterwards, the educator brings into consideration the Components of Pharyngeal Arch and describes extensively the Fate of the Pharyngeal Arch Components. Along with this, the Muscles of Pharyngeal Arches have been considered in-depth. At the end of this section, the educator has presented the Arteries of Pharyngeal Arches. The prime focus of section two is on the Nerves of Pharyngeal Arches. Firstly, the educator elaborately explains the Nerve of the First Arch followed subsequently by Nerves of Second Arch. Moving ahead, the educator also sheds light on the Nerves of Third Arches. The educator has then concluded by explaining the Nerves of Fourth and Sixth Arch. Section three discusses about the Cartilages of Pharyngeal Arches. First of all, First Arch Cartilage and Second Arch Cartilage has thoroughly been reported. In addition to this, Third Arch Cartilage has also been highlighted. Furthermore, the educator moves on to speak about the Fourth and Sixth Arch Cartilages. In the end, the educator has concluded by a talking about the Structures Derived from Arch Cartilages. Section four deals with the elucidation of the Pharyngeal Components. This section started off by a tabular description of the Pharyngeal Pouches. Next in line, the First Pharyngeal Pouch and Second Pharyngeal Pouch has also been brought into consideration. Subsequently, the educator has spoken about the Third Pharyngeal Pouch followed by Fourth Pharyngeal Pouch. Apart from this, Parathyroid and Pharyngeal Clefts (Grooves) have also been emphasized on. In addition to this, Cervical Sinus has been comprehensively elaborated. Towards the end of this section, the educator has highlighted the derivatives of Pharyngeal Membranes. Section five accommodates the Clinical Correlation. Firstly, the educator has talked about the Branchial Cyst and Branchial Fistula. Secondly, Branchial Cyst and Fistula has also been discussed. Furthermore, a segment has been devoted towards an explanation of the First Arch Syndromes and Treacher Collins Syndrome. In addition to this, the educator has shed light on the Pierre Robin Syndrome. To conclude, the educator has wrapped up by speaking about a syndrome entitled DiGeorge Syndrome.